Half a century ago this week, the Apollo 9 crew talked to the press about the details of their upcoming mission, scheduled for launch in three weeks. 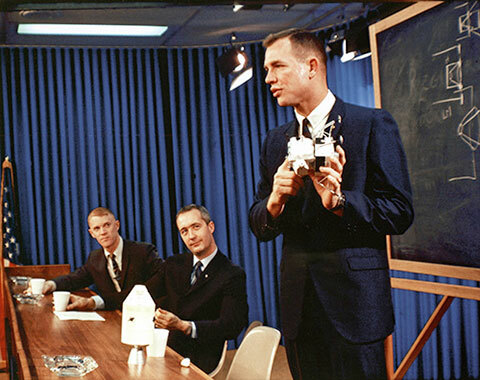 Command module pilot Dave Scott holds a LM model to visualise a maneuver, while lunar module pilot Rusty Schweickart and commander Jim McDivitt watch. Very nice seeing this photo of the only entire Apollo crew I have met, albeit seperately. All were all sociable and pleasant to talk to. I have been fortunate to have met at least one member of each of the other ten flown crews which all those years ago I would never have thought possible. Thanks for showing Ed. I concur with Kite. As a young lad watching the Apollo missions on tv, these guys were almost "god like": out of reach for mere mortals like me... akin to movie stars. Over the years I too have been fortunate to meet all three in the photo and many of their Apollo counterparts. It is only a shame that such encounters are now fewer and farther between. Meeting some of the Apollo astronauts in the UK was an amazing and unexpected experience for me. I met Dave Scott twice and had an instant connection with him as I had a boss in London who worked for him after he left NASA around 1980. Certainly took space photography to a new level in my opinion.